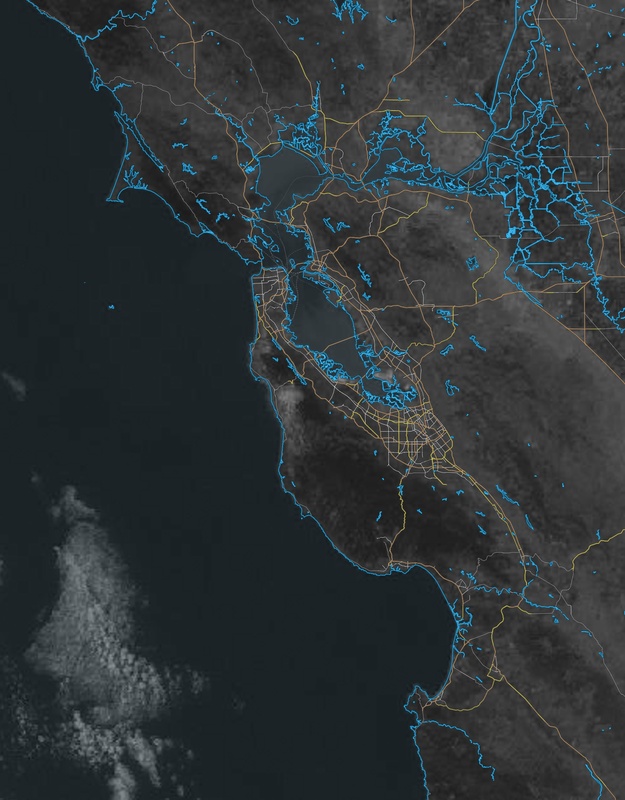 New: Look at historical patterns with Fogust! Update, October 25: So much for that. GOES-17 is moving in preparation for operational status. Falling back to GOES-16. Update, October 18: Hoping some recent reliability improvements will have the desired effect. Update, August 6: A warm welcome to GOES-17 (GOES-West), now gracing us with higher resolution and less off-nadir imagery! Ever wondered where the San Francisco fog line is? Now you can tell in realtime, with Fog Today, a project by Logan Williams. Fog Today uses data from NOAA's high resolution GOES-16 satellite provided by the University of Wisconsin-Madison Space Science and Engineering Center's Real Earth project. The satellite data has some artifacts due to Real Earth's Web Mercator rectification. This is a hobby project and there may also be missing images and glitchy data. If it's foggy when you get to the beach, it's not my fault. Have opinions or feature suggestions? Send me an email. Funding for GOES-16 and its planned partner, GOES-17, is currently in jeopardy. The Trump administration has proposed huge cuts to NOAA's National Environmental Satellite, Data, and Information Service. Not only will this mean more foggy beach trips, it will also mean hurricanes that are harder to forecast and wildfires that are more difficult to track.